Meet your guide in the French Quarter in the afternoon and begin your food tour of New Orleans at SoBou, one of three restaurants owned by the award-winning Commander’s Palace family. Sit down and relax as you are treated to three street food-inspired dishes that showcase modern New Orleans cuisine: fried pork cracklings, boudin balls with Creole mustard, and a BBQ Shrimp beignet. Listen to a narrative history of Louisiana cuisine, starting with the culinary contributions of local American Indian tribes and leading to the arrival of the Europeans and West Africans who created its Creole flavors. You’ll hear about the unique geography of southern Louisiana, as well as the linguistic origins of dozens of local dishes, from beignets and étouffée to gumbo and jambalaya. If you’d like, purchase a drink at the full bar before moving on to a stop at the Pepper Palace Hot Sauce Bar, where you can sample dozens of different hot sauces, BBQ sauces, dry rubs, seasonings and more. Third stop is Leah’s Pralines, a candy shop established in 1933. After learning its history, taste a Creole praline and sample the bacon pecan brittle. Next, bite into two New Orleans inventions: the muffuletta and the po-boy. Both are served at the funky dive NOLA Po-boys, a local joint with an immense menu. Discuss the 19th and 20th century history of the New Orleans' immigrants as you sample the fried catfish poboy on freshly baked New Orleans–style French bread before moving on to the slightly warmed muffuletta: an Italian-style sandwich of ham, salami, mortadella, provolone cheese, mozzarella cheese and New Orleans-style olive salad. The next stop is Tujague’s, the second-oldest restaurant in New Orleans, serving up classic Creole cuisine since 1856. Discover the culinary contributions of the butchers of the French Market while you dig into one delicious dish: the Bavarian-style slow-cooked beef brisket. Your final stop is Dickie Brennan's Tableau where you will enjoy a savory Seafood Gumbo. 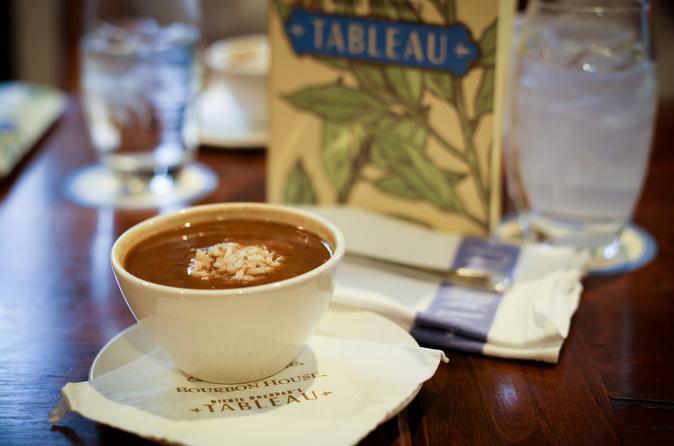 Tableau is owned and operated by a distinguished local restauranteur and located in the heart of New Orleans, the historic Jackson Square. By the time the tour ends happy hour will have started at Tableau. The walking tour covers about one and a half miles (2.4 km) at a leisurely pace.